As you probably know, I am in the midst of having a book published. We are in the editing stage at the moment. This is my first book so I am learning quite a lot as you can imagine. This particular project started out as a challenge so I just wrote every day. I did not outline and plan the story; I just let things twist and turn as I was writing. The Bible tells us that while we plan our way, the Lord directs our steps. I don’t know about you, but that brings me comfort! I know that when I am living in obedience to my Heavenly Father and something out of the blue happens or life turns in a way I wasn’t expecting, I can rest in the fact that I know Jesus is establishing my steps, even when the journey is hard. Oh, don’t get me wrong, I don’t always handle change well and certainly not difficult changes. But I do realize that God is in control and if I will rest in Him and His plan, I'll get through the change. More often than not, I don’t just get through the change; I come out better on the other side of the change! 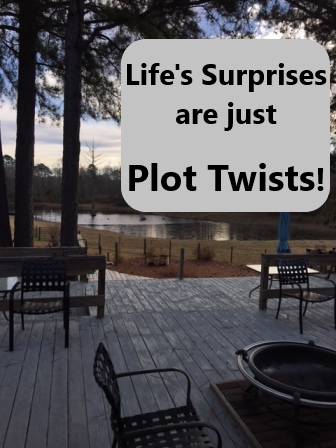 Have you experienced some “plot twists” lately? If you haven’t, hold on. They're most likely headed your way! Going forward, as you shout, “Plot twist!” remember that our Lord, Jesus, is in control. And even when we're surprised by some twist and turn in life, He is never taken by surprise. So, as you “plan your ways”, don’t etch them in stone because the “Lord is establishing your steps”, even when it is different from your plans.